As ClarkDietrich, we are now truly able to answer the challenges of any project, regardless of size or complexity. With a complete lineup of innovative products, plus technical support services and smart tools for design and specification, we're forging a new future for steel framing. 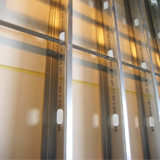 Many factors must be considered when your design includes cold-formed structural steel framing members. An architect typically specifies that the framing must conform to C955 and C1007. This course will review the manufacture and installation requirements of structural steel studs per these ASTM standards based upon the IBC code. It will also examine fire-rated assembly construction and loading capacities.